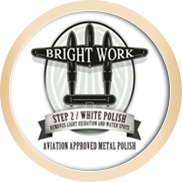 White Polish – is designed to remove light oxidation, water spots and cloudiness. 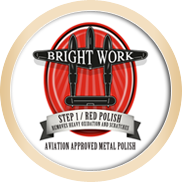 Bright Work Aviation Metal Polish can be used to polish all types of Aluminum, Chrome, Nickel, Brass, Stainless Steel and other metal surfaces. 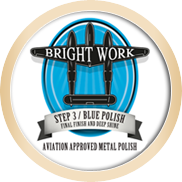 Bright Work Aviation Metal Polish has been tested to Boeing D6-17487, AirBus Aims09-00-002, AMS1650C, Douglas Aircraft CSD #1, and ASTM F 485 standards and has passed them all.